Handmade exquisite Bracelet All A Grade & Material are used to make this beautiful & Elegant Bracelet. 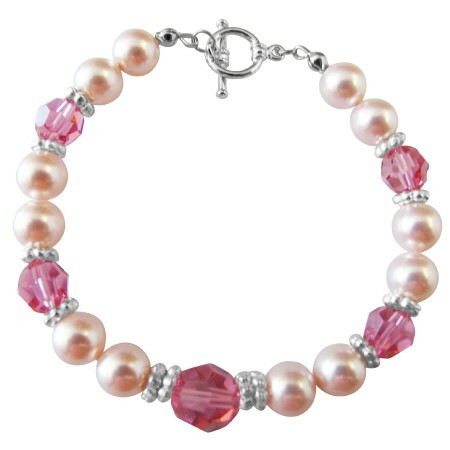 Rose Pearl 8mm with faceted 8mm Round Crystal & Bali Silver Spacer with 10mm Round Crystal in Middle with toggle clasp. The Bracelet measures 7 inches. It look fabulous & has a Classic look & is perfect to wear any occasion or a gift for loved. it is very nice & glam bracelet. Absolutely stunning! High quality product so that your item will last for long.